Happy Sunday, everyone! I just got home from a little party and I am in my comfy clothes and cozy by the fire. Love it. I thought it would be fun to share something fun today to mix it up a little. I love posts where you can get to know a writer or blogger on a more personal level. I tend to follow blogs where I can really connect with the writer. 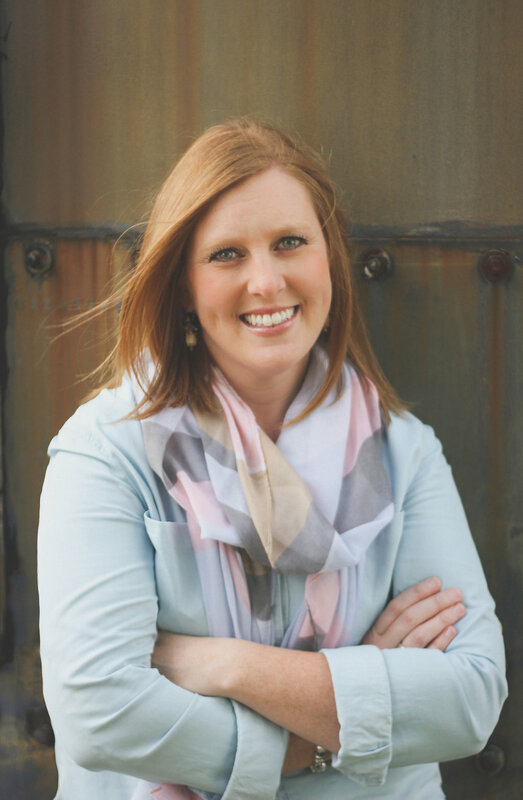 As much as I love writing about working on the farm, interior design, crafts and recipes, it's fun to be able to share things on a more personal level so you can get to connect and know me more! A few new blog friends of mine, [j.l.d.] Photograph and High Heels and Shotgun Shells created posts similar to Pioneer Woman's Fifteen Ways Marlboro Man and I Are Different. I thought they were such fun posts to read. I learned a lot about the writers and their spouse! I decided this was something I wanted to do but I added a fun twist to the idea to change things up a bit...... 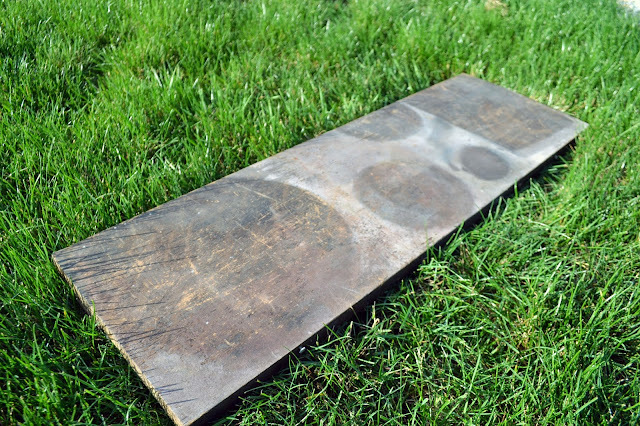 I explained these posts to my husband and asked him to list 15 ways we are different! He kind of grunted at first and felt like he was doing homework. I insisted it would be fun... he kind of rattled them off as he was flicking through Tractor House on his phone. It was so fun to see what he came up with! It's no secret that my favorite time of year is fall harvest. We work the ground in the spring, plant seed and watch our crops grow and grow all summer long. We pray for rain. But not too much rain. We check and keep tabs on the crops to see what type of weeds, fungus and insects are lurking about. 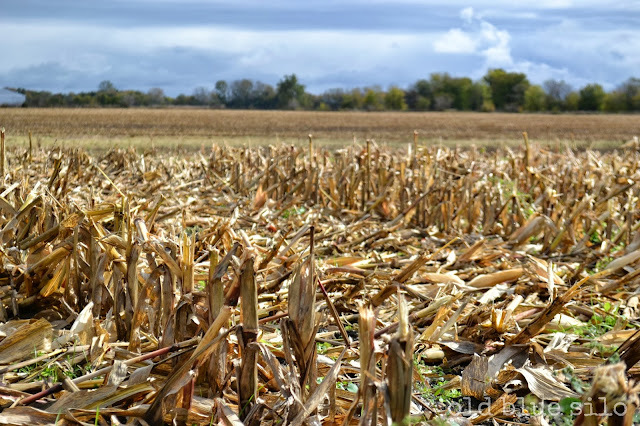 August and September come around and we enjoy watching our crops turn brown knowing that harvest is just around the corner. 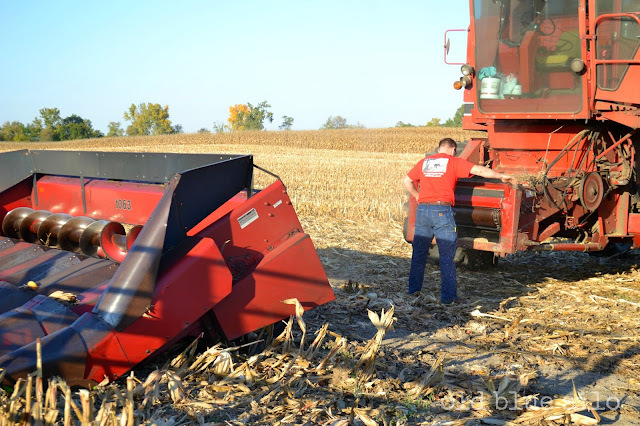 Harvest is something every farmer looks forward to. 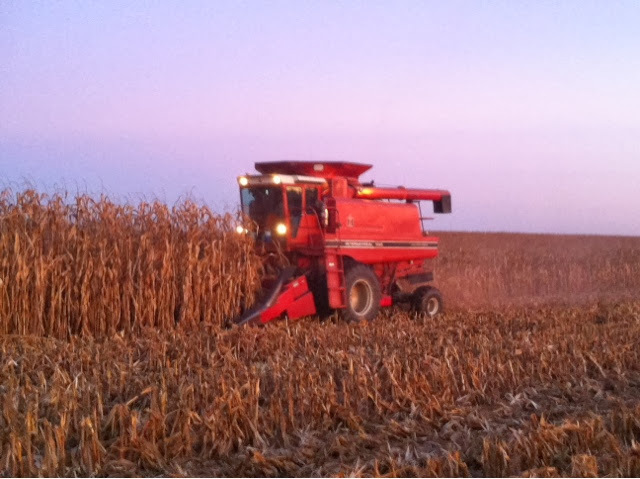 We love to watch to our yields, run the equipment and work sun up to sun down. Meals with the family are enjoyed in the field and we get to work together as a team. Life is a fast-paced, crazy frenzy and the adrenaline rush is like being at a Garth Brooks concert. There's such a good feeling that rushes over me as I fill my water jug for the day, throw on my favorite boots and tuck a pair of work gloves into my back pocket. I know that as soon as I walk out the door, I'm going to be involved in something special. Something so great and rewarding that I wish everyone could get the chance to experience. There's a sense of accomplishment as you watch the combine make the last swath in a field as it heads over to dump the remaining grain onto the semi for the last load. 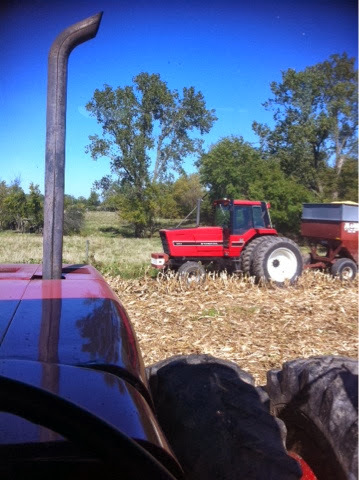 I am very lucky that I fell in love with a farmer who only lives 20 minutes away from my parents. It's so easy for me to run over to visit and they try to stop by when they can. We can celebrate all the holidays together especially birthdays. We can call each other up and go out for a last minute pizza. My mom and I can go shopping together. I really am lucky. 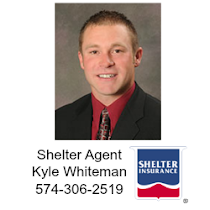 However, whether you're 20 minutes away or 20 hours away, it's never easy to adjust to a new home. I lived in the same house my whole life with the exception of moving off to college. Even then, I still came home almost every weekend and all summer. When I first started dating my husband, I made a lot of friends and connections in the area. The county where he lives is a little different than where I came from. The people are different. The culture and values are somewhat different. People even spoke differently. It was a good adjustment at first. I found myself spending a lot of time down at his farm and out with my new found friends. I was having fun. I was experiencing the life I always wanted. We went over to his parents a lot to visit. It sort of felt like home right away. I've been craving mulled cider like you wouldn't believe. 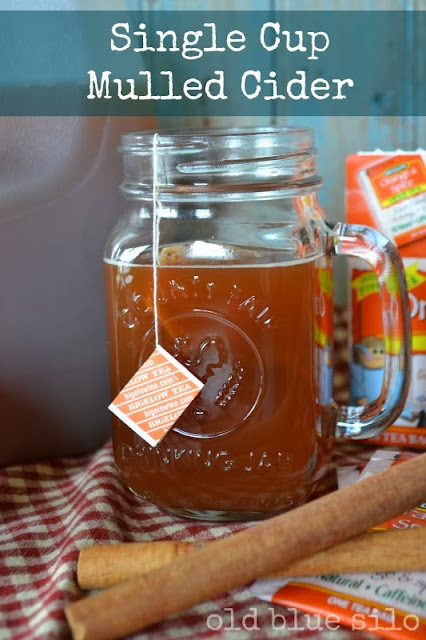 I'm talking the warm, steamy stuff that's been brewed with cinnamon sticks, oranges and cloves. The kind of cider you find at a good harvest or Christmas party simmering in the crock pot. Well, since I am not going to a harvest party or Christmas party anytime soon, the chances of me indulging in a crock pot full of steamy, mulled cider are far and few between right now. I've been craving it so much that I was seriously going to run to the grocery store and buy a few oranges but than an idea popped into my head! 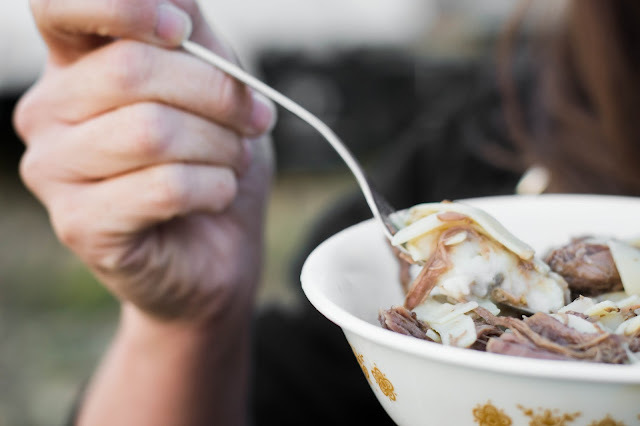 Why make an entire crock pot full for one person when you can make a single cup? I can't believe October is half over already. 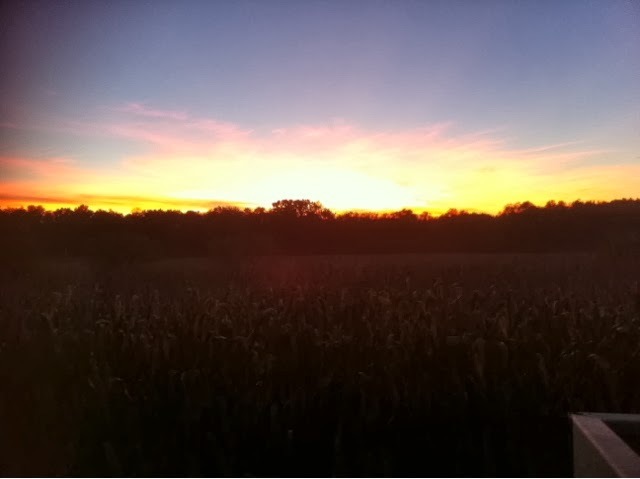 It's be an amazing fall here in Northern Indiana. One of my favorites. In fact, our annuals are still alive and even some of my spring blooming creeping flox are confused with their cute little buds. Our trees are JUST NOW starting to change. 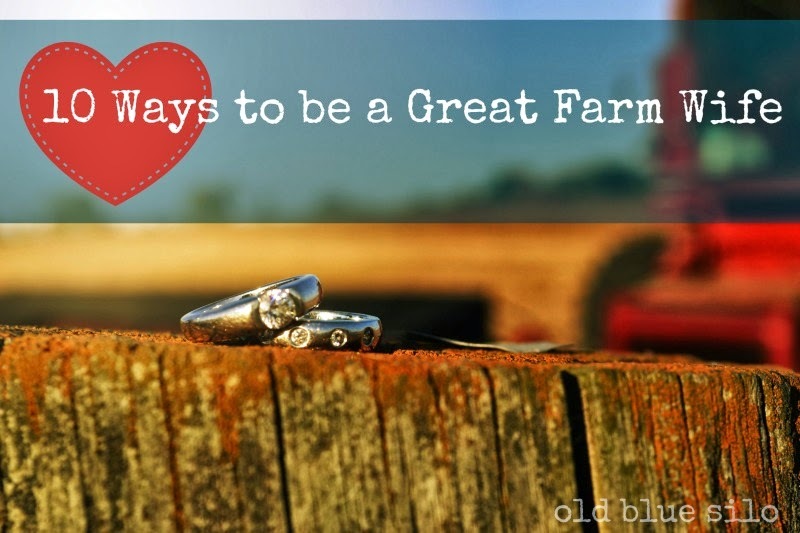 Two days ago, I wrote about 10 great ways to be a farm wife. 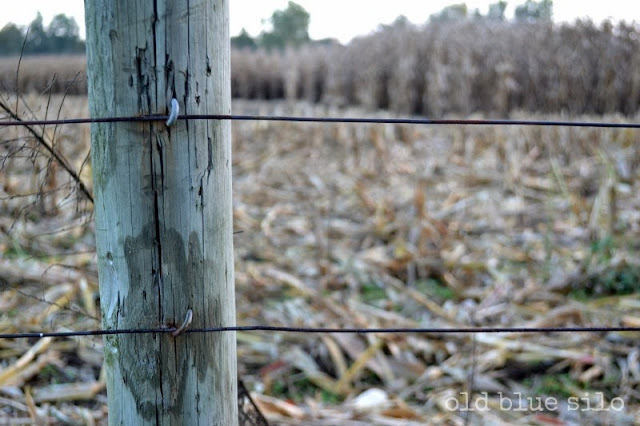 Today I am writing about one of the hardest things about being a farm wife. 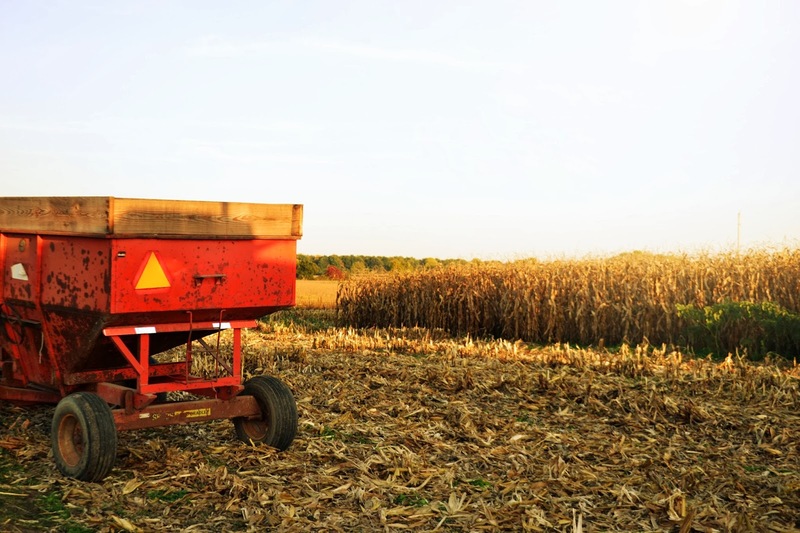 Seeing or hearing about a farm accident is something that hits so close to home that it makes your stomach churn even if you didn't personally know the person that was killed. All you can think about is that could have been my husband. My home community where I grew up lost a very young farm hand this week. It's not something that happens often, but when it does, the news spreads like wildfire and instantly everyone reconnects wanting to know how, when and why. I feel like when an accident happens in a small town it becomes a part of everyone's life whether you knew that person or not. If you didn't them, you sure knew someone that did and that's all it takes to get emotionally involved. It tugs at all of our hearts and our minds. When it happens in a big city, it's just another head line to get lost in the news. That's the beauty of a small town. You'll never find a more amazing support group. I knew this gentleman personally but he wasn't a close friend that I kept in touch on a regular basis. When we'd run into each other he always asked about my dad. He always thought very highly of my dad. My brother and I grew up playing with he and his sister occasionally when we were kids. 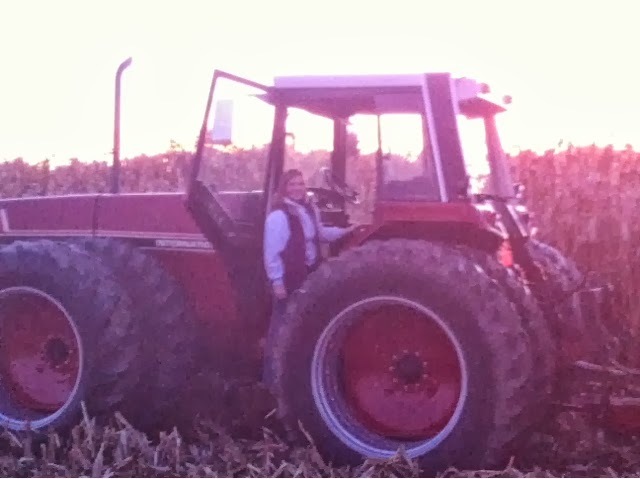 I can still remember his bedroom lined with shelves full of toy John Deere tractors clear as day. He and my brother would play with those toy tractors for hours. I worked at John Deere dealership the last few years and he came in quite often to purchase toys for his son. I know I say this all the time, but I absolutely love this time of year. It's the busiest part of my life but a good busy. Wouldn't have it any other way! I haven't been bored since the day I was born and I don't plan on it anytime soon! 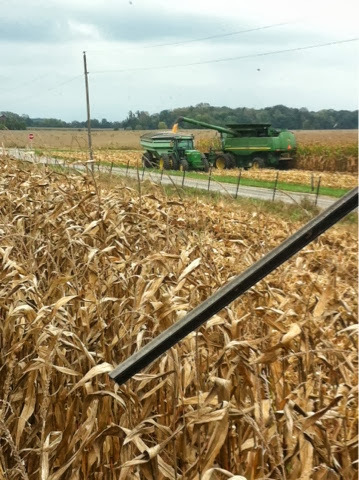 We're into harvest full swing, the leaves are changing colors and the weather is perfect. It's been 72 degrees and sunny the last several days with cooler, crisp evenings. I've been running around like a mad woman just soaking it all up. This time of year, it doesn't matter what you're doing outside; even if it's just picking weeds, it's enjoyable! I've been busy doing all things possible outside and helping with harvest when needed. I haven't had a lot of time to work on much for the blog. 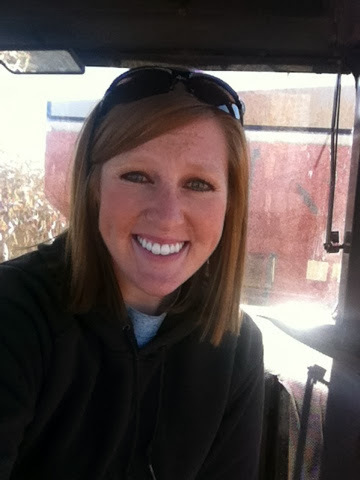 I really do enjoy the agriculture-heavy posts and sharing our family farm with you, though. It's what I love and spring and harvest is when you're going to hear and see a lot of it. Through the ups and the downs, I enjoy every moment of harvest season and it really is my ultimate high. 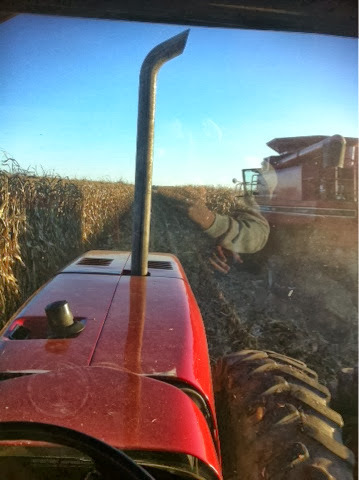 From preparing and eating meals with my new family in the fields, going on parts runs, accompanying my husband in the semi to the grain elevator, running the grain cart, riding in the combine with my husband in hopes he will turn me loose same day (ha! ), soaking up the beautiful scenery, late night chats with my mother in law as we follow the guys with our flashers to make sure they make it back to the mill safely to sinking into my cozy bed at night after a long day of running around. It's just the best. And I can't get enough of fit! A couple of weeks ago, before leaving my mom's house, she dumped a few things in the back of the truck. Included with a few mason jars was an old board. Not knowing why she was giving it to me, I was still excited and took off. I don't question when someone offers free "junk" to me because I know I will always find a use for it down the road. 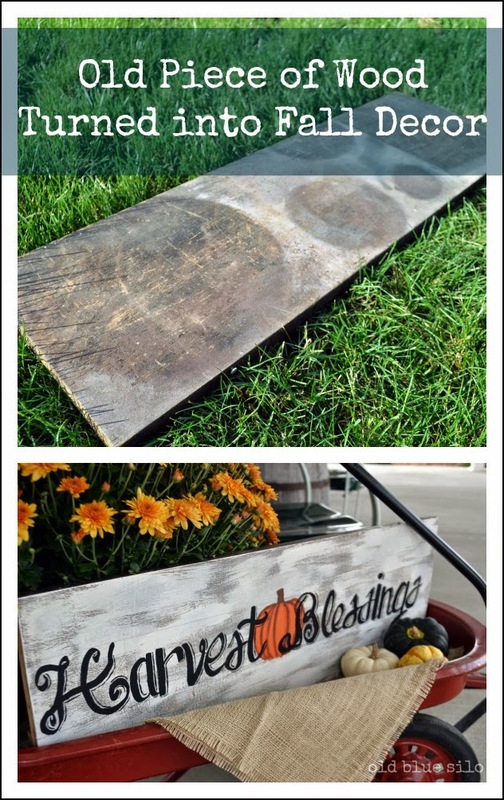 I've been wanting to make a sign to go out on the front porch for harvest. I wasn't quite sure what I wanted my sign to say. I don't like decorating for Halloween because it's so short lived. If you stick with "harvest" type decor, it can usually last you until Christmas. So, I tried to come up with the perfect fall-ish saying to put on my old board. 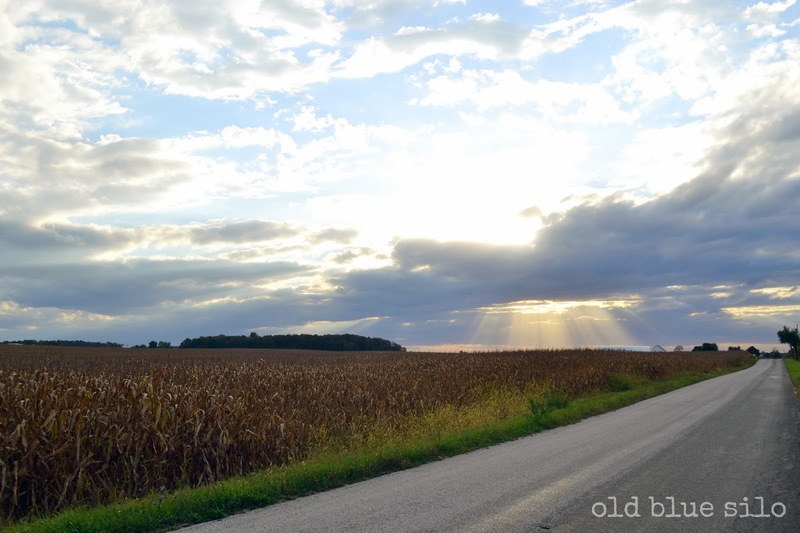 Last week, I wrote a post called Harvest Blessing refering to my favorite time of year. This time of year really is a blessing to me and it's definitely a good time to count our blessings as well. I decided I wanted my sign to say Harvest Blessings. We have gotten off to somewhat of a slow start to harvest this season and I've noticed it has weighed on my husband some. We've had some rain. 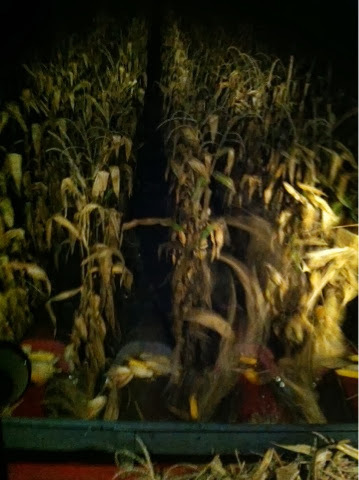 The combine is not calibrating the way it should and they're still having issues with the corn dryer. My husband was unable to get a hold of the repair man for the dryer and my father in law was held up a few evenings out of town this week while trucking for his day job. I took dinner out to the field the other night and checked to see if my help was needed. My husband was pretty quiet and didn't say much as he ate the food I brought him. You could tell his mind was going a million directions. When he's really quiet on the farm it usually means he's thinking about something, what he needs to do next or he's missing his grandpa. We sat in silence for several minutes until he finally spoke up. "There's always something......." he slowly said, shaking his head. "That's what my grandpa told me one day. There's always going to be something." He thought for a while and continued slowly. "My grandpa wasn't a man who cussed; but when he did, it was always followed by the words there's always something." He half chuckled and cracked a smile as he said this. By this time, his eyes were getting glossy but he didn't drop a single tear. Struggling to find something encouraging to say I blurted out "This is what you love." 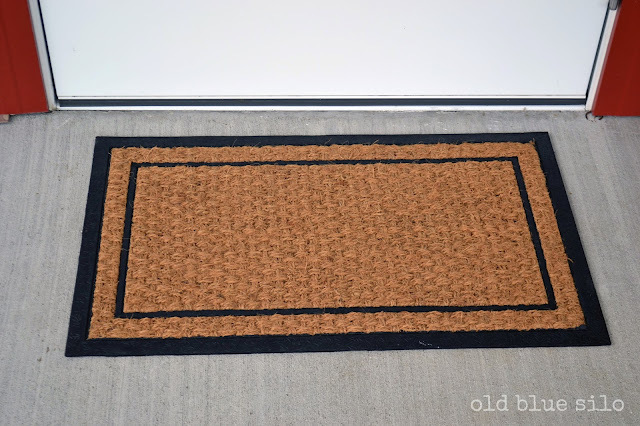 When I started decorating our front porch for fall, I wasn't loving our front door mat that I settled with for lack of finding something better. It was kind of summery and pretty colorful. I cleaned it then put it away in storage because it was taking away from my rustic look and fall colors. Unfortunately, every front door mat that I've fallen in love with is too thick for our outward swinging door. I finally found just a thin, plain, basic good old rubber and coir door mat at walmart for $6-7. Hmm. I still wasn't thrilled. Although, some things are better off as less is more, I felt like this mat needed a little something more. I thought about painting pumpkins on it or something to do with harvest but then I thought it would make more sense to have an all-season theme then it will be one less thing I have to change out at harvest and Christmas time. Don't get me wrong... I love decorating for the seasons but sometimes all the details can be a lot of work. I thought and thought and thought for days over what I wanted to put on my mat. You would have thought with how hard I was thinking that I was a highschool student trying to figure out what college I wanted to go to. Or you may think I need to get a life. But hey, that's just how I am. It's all about the details. So anyways, I decided to do our name in our farm logo font and a silouhette of a tractor. 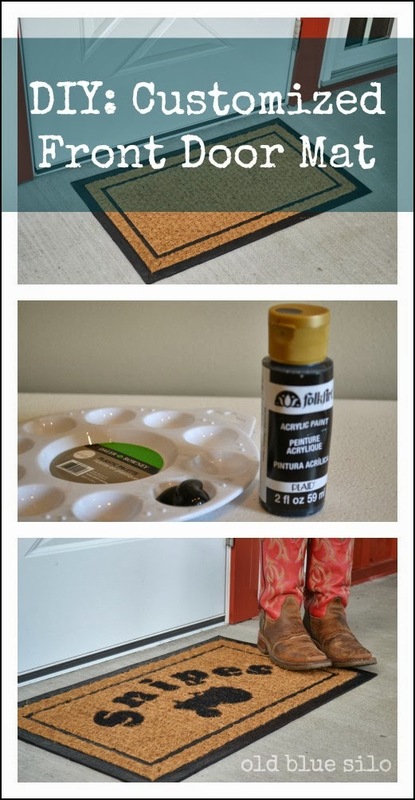 Yet another easy DIY project that you guys can do too! Here's what I came up with and how I did it.